Did a security failure contribute to this senseless Orlando apartment shooting? 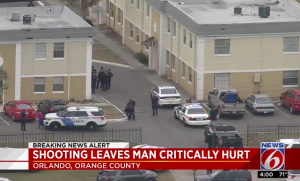 Police are apparently still searching for suspects after a man was shot and critically injured outside the Catalina Isle apartment complex in Orlando Monday afternoon, January 8, 2018. What additional security measures, such as gated entry, surveillance cameras and security patrols, were implemented by the complex owner following media reports of prior criminal activity on property?